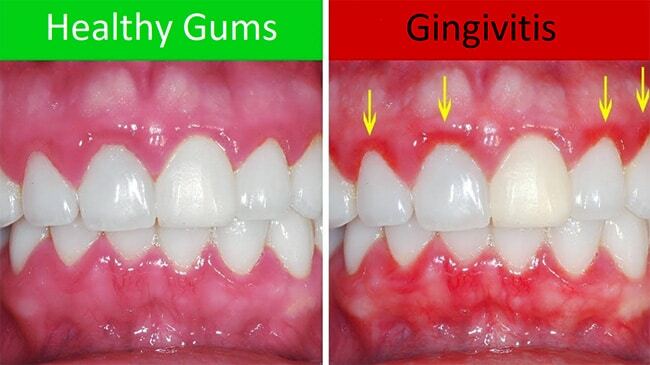 Gingivitis is the most basic form of periodontal disease (gum disease) which involves inflammation of the gums. This minor inflammation of the gums is a common dental problem & is not serious in itself, but does represent a larger issue that may result in the loss of teeth when the cause is left untreated. Periodontal disease and gingivitis are preventable through the proper, daily maintenance of teeth and occasional visits to the dentist. When left untreated, gingivitis can become Periodontitis which, additionally, involves the loss of bone tissue and is treated as a much more serious gum condition. Early gingivitis detection is critical in treating the underlying cause. Early treatment of gingivitis can save you thousands of dollars and many visits to the dentist’s office over time as this disease can cause an abundance of serious issues. Take a loot at the preventative dental treatments we have to offer. Many symptoms may be minor or unnoticeable with mild cases of gingivitis, but still represent a serious issue that should be treated by a dentist. If you’re experiencing symptoms of gingivitis, then get help from an experienced dentist today at Carson & Carson, DDS in Oxnard, California. Call today to schedule an appointment (805) 983-0717. Gingivitis is the first sign of periodontal disease and is directly caused by the buildup of plaque on the surfaces of teeth. It is most commonly caused by poor oral hygiene that leads to a layer of plaque forming on teeth and the eventual loss of teeth from gum disease. Formation of plaque layer on teeth – Plaque is a layer of bacteria that grows quickly when your teeth interact with food. When not removed by daily brushing or flossing, plaque is left on the surface of teeth causing irritation and triggering an immune response in the gums. This symptoms in this step of the process can be so mild that they go unnoticed. Excess plaque hardens into tartar – When left on teeth, plaque can harden into tartar making it even more difficult to remove and causing further irritation of the gums. Tartar acts to protect the plaque layer on teeth by creating a protective barrier and worsens the irritation of the gum tissue. Gingiva (gums around your teeth) become inflamed – Tartar irritation of the gums leads to a stronger immune response and further inflammation of the gingiva. Over time, this irritation can cause the gums to become tender and swollen resulting in bleeding during brushing or flossing. When left untreated, gingivitis can develop into a far more serious version of periodontal disease known as Periodontitis. Periodontitis – This stage of periodontal disease involves the destruction of gums and bone tissue that surround teeth as the immune system reacts to infection in the gum line. The irritation of the gums caused by excessive plaque on the teeth triggers an aggressive response from the immune system where the body destroys the tissue and bone surrounding teeth in order to rid itself of the infection. This stage of the process can still be unnoticed, and may result in the loss of teeth through eventual loosening. The best plan for treating this level of periodontal disease is avoiding it altogether through preventative action and a solid oral hygiene routine. 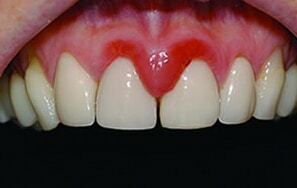 Age: Gingivitis becomes more likely to occur as we age. Poor Oral Hygiene: Poor oral hygiene habits can lead to the buildup of plaque and early gingivitis occurrence. 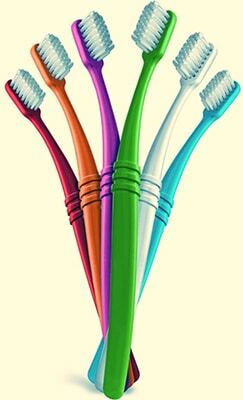 Determining the state of your current oral health can give essential clues that may lead to early gingivitis detection. Medical Conditions: Diabetes, certain cancers, and HIV all put you at greater risk for suffering from gingivitis and periodontal disease. In general, any condition that weakens your immune response increases your risk of getting gingivitis. Dry Mouth: Having a reduced amount of saliva in the mouth can result in plaque buildup that can lead to gingivitis. Conditions that cause or worsen the effect of dry mouth also indirectly put you at risk for gingivitis. Tobacco Products: Smoking or chewing tobacco can result in a number of health issues especially in areas around the mouth and throat. The use of tobacco products not only puts you at greater risk for gingivitis and periodontal disease, but also increases the risk of encountering oral cancers. 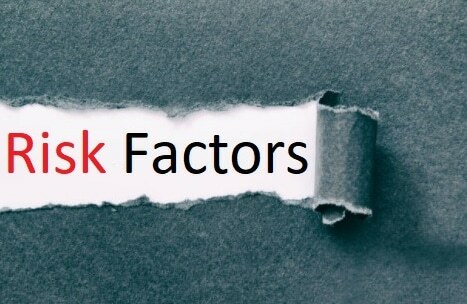 Genetics: Genetics and family history do play a role in your risk of developing periodontal disease. If your parents have ever had gingivitis, then you might be at greater risk for developing it too. Vitamin C Deficiency: Those who take on diets that have unsatisfactory levels of Vitamin C have historically seen a higher incidence of periodontal disease. Hormonal Fluctuations: Pregnancy, puberty, and menopause are accompanied by hormonal changes that can cause the gingiva to become more sensitive resulting in an increased risk of inflammation of gum tissues. Prescription Drugs: Drugs that cause dry mouth can indirectly contribute to periodontal disease. Some drugs that are used to treat epilepsy, angina, and high blood pressure have been known to create dry mouth which can lead to periodontal disease. Brushing twice and flossing at least once daily – Proper care for your oral hygiene is the number 1 thing that will help prevent gingivitis. Applying oral antibiotics to treat bacterial infection in the mouth – Plaque is a form of bacteria, and certain antibiotics have proven effective in stemming the infection that is brought upon gums from the presence of plaque. Gum Flap Surgery – When a deep cleaning is not sufficient enough to remove excess plaque buildup, flap surgery may be used to lift back gums and remove plaque and tartar from the deep pockets from the root surface of teeth. Bone Grafting – Replacing and repairing the lost bone structure that is caused by advanced periodontal disease such as Periodontitis can be done with a procedure such as bone grafting. In cases of minor periodontal disease such as gingivitis, bone grafting is not a commonly used treatment. Since 1970, our experienced dentists have helped thousands of patients prevent and treat periodontal diseases such as gingivitis and Periodontitis. We have saved many teeth from early retirement & saved our patients millions in dental costs with this preventative care. Get help today from veteran Oxnard dentists with over 45 years of experience at Carson & Carson, DDS located in Camarillo and Oxnard, California. Find affordable dental services across all fields of dental specialties available from caring and seasoned dentists (805) 983-0717. We are also proud to offer 24/7 availability for emergency dental treatment.